At PoolStar the Henderson and Las vegas swimming pool cleaning service provider all technicians are required to take and pass the “Certified Pool/Spa Operator Certification Program” examination offered by the national swimming pool foundation. The CPO certification program includes pool and spa chemistry, testing, treatment, filtration, automatic feeding equipment and government requirements. We take pride in being able to offer this peace of mind to our customers knowing that they are dealing with professional certified technicians that care for their swimming pools. 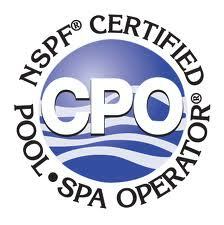 This entry was tagged Certified Pool/Spa Operator® Certification Program, CPO. Bookmark the permalink. ← Swimming pool freeze protection tips.